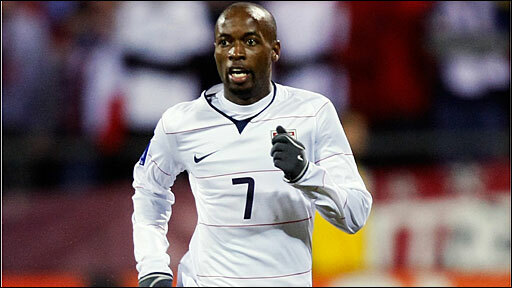 Former Rangers midfielder DaMarcus Beasley has been included the United States' 23-man World Cup squad. The 28-year-old, who left Rangers at the end of the season, only returned to the US team in March after a nine-month exile from Bob Bradley's team. "He needed to make a renewed commitment and do things as a player that makes his team better," said Bradley. West Ham's Jonathan Spector, Fulham's Clint Dempsey and ex-Everton midfielder Landon Donavan all made the cut. Donovan, Hannover's Steve Cherundolo and Beasley will be representing the US in their third World Cup. Beasley, who has earned 90 caps for the US, played his last game for Rangers on 9 March but has done enough to convince Bradley of his place in South Africa. Strikers Edson Buddle and Herculez Gomez are among 15 players featuring in their first World Cup. Los Angeles Galaxy's Buddle has been in excellent form in Major League Soccer while Gomez became the first American to lead a foreign league goal-scoring chart with 10 goals for Mexican club Puebla. "Both have been in great form, scored a lot of goals this year," added Bradley. "As we move into the World Cup, players who are on a roll come in handy. "When you make tough decisions you try to factor in everything. You take into account where they are in their season and certainly to this point Edson is one of the best players in MLS." Seventeen of Bradley's squad are based in Europe, including nine players from Britain and four in the MLS. Defenders Chad Marshall and Heath Pearce, midfielders Alejandro Bedoya, Sacha Kljestan and Robbie Rogers and and forwards Brian Ching and Eddie Johnson all missed the cut from Bradley's provisional 30-man squad. The squad will visit United States President Barack Obama at the White House on Thursday before a pre-World Cup friendly against Turkey in Philadelphia on Saturday. Bradley's team depart for South Africa on 30 May before their final pre-tournament friendly against Australia. The US face England in their opening match of the World Cup in Rustenberg on 12 June. Forwards: Jozy Altidore (Villarreal), Edson Buddle (Los Angeles Galaxy), Robbie Findley (Real Salt Lake), Herculez Gomez (Puebla).